This course will offer a comprehensive history of books in China to 1368, the last year of the Yuan dynasty, with reference to relevant developments in Korea and Japan and to parallels in the West. It treats the subject in the broadest sense from the advent of actual books in East Asia during the first millennium BCE until their relative maturity in the fourteenth century. The particular foundations underlying the history of the book and of printing in China will be presented in detail. Visual images and many actual specimens, including rare books, will be used to reinforce presentations and stimulate discussion. The conception, production, transmission, and consumption of traditional Chinese books will be discussed in this course, and key topics will include but not be limited to the following events and activities in China: the advent of script in China and its ubiquitous presence before books, text-bearing objects that are not books, pre-paper books, the origins of bibliography, the invention of paper, book forms and format, seals and ink-squeeze rubbings as proto-printing, woodblock printing and the invention of movable type, the transmission of printing to Korea, Japan, and China’s border regions, uses of language and script in publications, manuscript culture, the “golden age” of printing and publishing in the Song and its continuation in the Yuan. This course is intended for anyone interested in the cultural history of the book in East Asia and is especially suitable for persons knowledgeable of other book cultures. H-145: The History of the Book in China since 1368, is intended to complement this course. Required readings are all in English and knowledge of Chinese, Japanese or Korean is not necessary. Advanced readings in languages other than English will be made available to anyone requesting them. Soren Edgren teaches this course. Soren Edgren teaches a precursor course, "The History of the Book in China." Beginning in 2019 the course is split between H-85 (to 1368) and H-145 (since 1368). 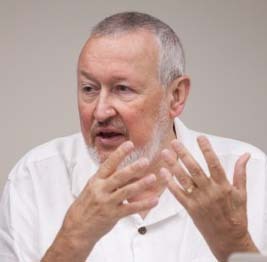 James Soren Edgren was Editorial Director of the Chinese Rare Books Project, an online international union catalogue of Chinese rare books based at Princeton University from 1991 to 2011. The project currently is being transferred to the National Library of China in Beijing, where the new International Union Catalogue of Chinese Rare Books database has been established. Edgren received his Ph.D. in Sinology from the University of Stockholm and has worked as East Asian cataloguer and bibliographer in the Royal Library (National Library of Sweden) in Stockholm, as well as having been active in the antiquarian book trade. In addition to dozens of scholarly articles, he has written the Catalogue of the Nordenskiöld Collection of Japanese Books in the Royal Library (Stockholm, 1980) and Chinese Rare Books in American Collections (New York, 1984). He delivered the inaugural Delisle lectures on the history of the book at the Bibliothèque nationale de France in 1997, and served as Associate Editor for The Oxford Companion to the Book (Oxford, 2010). In the fall semester of 2012, he began teaching a graduate seminar on The History of the Book in China at Princeton University.